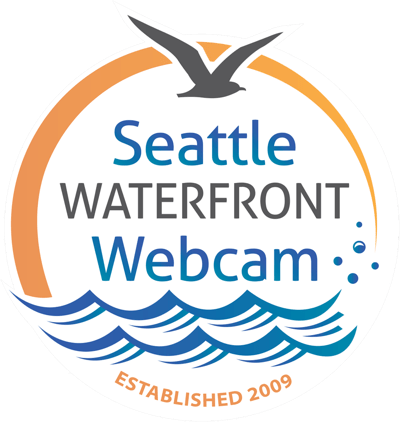 Welcome to the Seattle Waterfront Webcam (SWW), which live streams images of downtown Seattle’s Waterfront, the Alaskan Way Viaduct, the Seattle Great Wheel, and West Seattle. The Seattle Waterfront Webcam is located in a westerly facing window on the fifth floor of the 98 Union Condominium at the corner of First Avenue and Union Street in downtown Seattle. West Edge neighbors include the Four Seasons Hotel & Residences, the Seattle Art Museum, and the Pike Pub & Brewery. Seattle’s iconic Pike Place Market is situated just a salmon toss north of the Seattle Waterfront Webcam. Among the sights visible from the camera’s ever-streaming eye are the silent majesty of the Alaskan Way Viaduct (which shut down to traffic in January 2019), the ever-changing maritime traffic in Elliott Bay, and the revolving majesty of the Seattle Great Wheel on Pier 57. In March of 2019, demolition of the Viaduct will begin in earnest. And from the Seattle Waterfront Webcam you will be able to watch the excavators “eating” their way through the 66-year-old structure and the loaders and bulldozers hauling away the remains! You can also watch the Bainbridge Island and Bremerton ferries arrive and depart from Colman Dock, the West Seattle foot ferry speeding across the water, hulking masses of oceangoing tanker ships as they head out to sea, tugboats of various shapes and sizes as they maneuver the big ships, and all manner of pleasure craft cavorting across Puget Sound. And don’t forget about Seattle’s often-brooding skies and ever-changing cloud banks. Private jets winging their way toward Boeing Field, jaunty helicopters transporting news crews and hospital patients, and seagulls scavenging for their latest meal speed through the sky. Look closely and you might even spot a pod of the region’s beloved orca whales frolicking in the Bay. From a more pragmatic point of view, the Seattle Waterfront Webcam serves as a good barometer (pun intended) of the weather in downtown Seattle. It is quite an impressive spectacle to see a storm front full of clouds, rain, billowing fog, and/or even snow blowing in over Puget Sound! Curious about what's happening along Seattle's lively Waterfront? Then sign up for occasional e-newsletters to find out more. We promise not to send too many or sell your address to others.